The 20th Brussels Flower Carpet will take the theme of Japan to celebrate 150 years of Belgo-Japanese friendship. In these cold winter months it’s useful to have something to look forward to. And the Flower Carpet is certainly something that will light up the summer of 2016. 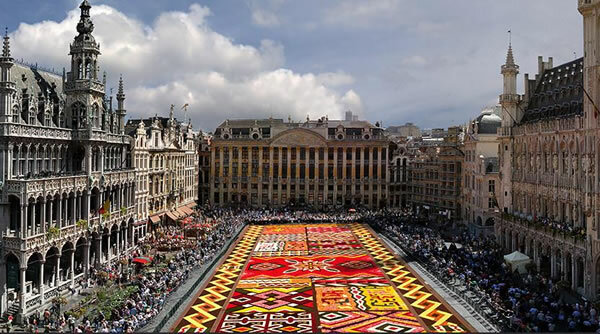 Every two years, in the month of August, the Brussels Grand Place is adorned with a beautiful floral attire and becomes a gigantic ocean of flowers. 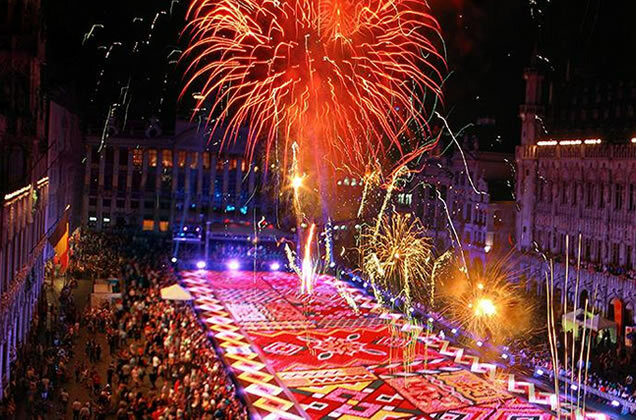 This year will be even more special, as the famous carpet of flowers will be celebrating its 20th anniversary. In 2016, Belgium and Japan will be celebrating 150 years of diplomatic and friendly relations. 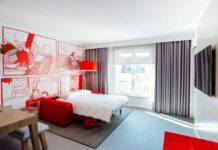 It is therefore perfectly natural that the organizers have chosen to let the colours of Japan inspire the design of the carpet. More than 100 volunteer gardeners put together this giant floral puzzle in less than four hours. The day before the opening, the spaces between the floral motifs are filled in using rolls of sod. The flowers are so closely-packed (300 per square metre, i.e. around 600,000 flowers in all!) that they can’t be blown away, and indeed they create their own microclimate! If there´s a heat wave, the sod is watered to prevent it from wilting. If the weather is too wet, the grass can grow by 4 to 5 centimetres in 3 days. The flowers remain fresh and preserve their splendour during the four days. One of the secrets to the longevity of the flower carpet is the robust tuberous begonia. A native of the West Indies, the begonia is resistant to all weather conditions: intense sunshine, violent winds, rain, cold. Begonias come in a rich palette, ranging from the most vivid colours to delicate pastel shades, with in between the many-coloured and white flowers that reflect sunlight so well. Belgium is the world’s largest producer of begonias: 60 million bulbs each year. 80% of the total production, cultivated almost exclusively in the area of Ghent since 1860, is exported, primarily to the Netherlands, France and the United States. The general public will be invited to come and admire this Japanese creation on 13, 14 and 15 August 2016, from 10h00 to 22h00, on the Brussels Grand Place.